As a rule, I try not to pay much attention to the snap polling conducted at the end of advance screenings. But the audience’s tepid response to this week’s preview of First Man was too telling to ignore. The universal round of applause did not greet the final credits, and most of the praise offered at egress was muted and lukewarm. “It was too long” seemed to be the consensus. We just saw a man walk on the moon: Shouldn’t we be a little more roused? Not necessarily. Of all the things it isn’t, Damien Chazelle’s Neil Armstrong movie is not a space odyssey. Despite its IMAX release, and to its distributor’s likely chagrin, it doesn’t trade in the focus-grouped spectacle of the space-travel blockbusters of recent years — Gravity, The Martian, to some extent Interstellar. Nor is it imbued with the rhapsodic Space Race uplift of Hidden Figures. 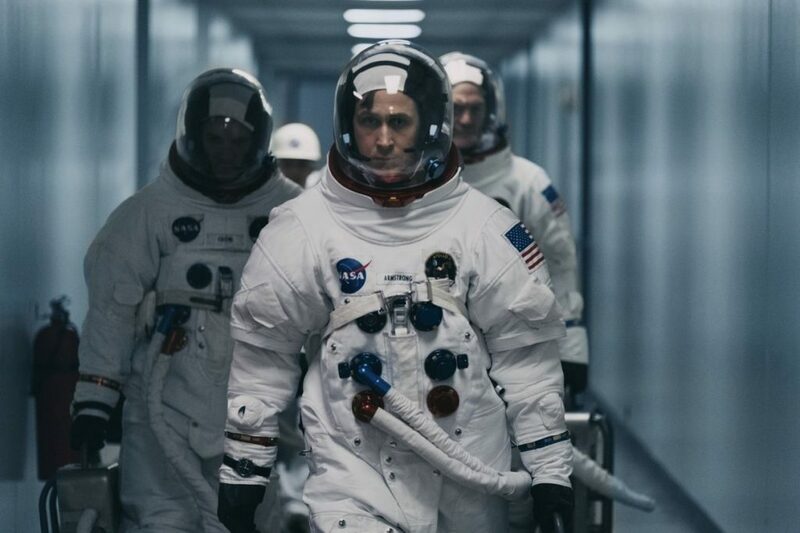 Even when depicting an inherently patriotic moment in American history, Chazelle looks askance at easy triumphalism, preferring a somber, internalized hero’s journey in which long, silent exchanges resonate as loudly as the Apollo 11’s thrusters. More than once, the anguished face of Claire Foy, as Armstrong’s wife Janet, reminded me of Carl Dreyer’s Joan of Arc as it filled the grainy frame. First Man is a wondrous rarity: a $59 million art film. This is evident from the movie’s opening scene, which plunges us, in media res, into a plane hurtling out of its pilot’s control. Without the benefit of an establishing shot, or even a medium shot to contextualize the action, we’re lost in the shuddering abstraction of Chazelle’s editing rhythm: a plane’s wing, a nonfunctioning joystick, ominous screen displays, the widening eyes of Ryan Gosling beneath his helmet. It’s all constituent parts without a whole — pure cinema, free of storytelling obligations. Finally, Gosling’s Armstrong manages an emergency landing in the terrestrial vacancy of the Mojave Desert, and Chazelle permits a dateline. It’s 1961, and we’re seemingly eons from the moonshot. For a format nerd, the best part about this introduction, and the entire movie, is its lo-fi warmth. Chazelle shot the aerial scenes in 16mm and the earthbound ones in 35mm. For viewers weaned on the 4K vividness of HD screens, the chasm in clarity is striking. For much of the movie, the director chose formats more associated with ’70s home movies, or grindhouse flicks. In other words, the movie looks indistinguishable from the actual video footage of Armstrong. Verisimilitude trumps accessibility. That I’m saying this about the director of La La Land is as surprising to me as it is to you. Equally alienating to Hollywood convention is Chazelle and Gosling’s honest portrayal of its famously reclusive, media-averse hero. It’s hard to imagine a more inscrutable, uncharismatic protagonist than Armstrong, and Gosling plays him as a taciturn automaton on the functioning end of the spectrum — a husband and father of three children who lacks the wiring to be a family man. The movie posits the loss of Armstrong’s second child, Karen, to cancer, at age 3 — her death is depicted with an aching matter-of-factness — as the key factor in the emotional barriers he erected around him. Whether this pop psychology is entirely accurate or not, it grounds the character, providing a narrative shorthand for his avoidant, compartmentalizing tendencies. Chazelle divides his movie between the Armstrongs’ quietly roiling domestic life in the Houston suburbs with the nitty-gritty of Neil’s career: the training sessions, test flights and fatal tragedies that built up to the historic moon landing in 1969. The director, continuing to favor the shaky-cam intensity of the opening sequence, plays the same visual card a bit too often. Unless you’re Neil deGrasse Tyson, you’ll be lost, and perhaps a little bored, during the fitful launches on the road to moon landing, with their panicked close-ups of numbers and gears that don’t mean much to the layman. What does translate is the human sacrifice of the manned space missions. As a number of Armstrong’s fellow-astronauts — some of them played by likable, familiar actors like Jason Clarke, Patrick Fugit, Lukas Haas and Brian d’Arcy James — perish from crashes and cockpit fires, First Man takes on the tenor of a war film, with Armstrong often fielding the grief-stricken casualty reports. It’s clear, by the time the doors clamp shut on Apollo 11, that there’s a decent chance Armstrong and Buzz Aldrin (Corey Stoll) are ascending on a cosmic coffin. Armstrong’s giant leap for mankind is presented as the surreal pinnacle of American engineering, drive and fearlessness, one that many of us have taken for granted, and no longer will. In First Man, it’s an immediate, urgent, tactile achievement. That we haven’t returned in 49 years of technological progress is an observation for another column, perhaps. In one of his more eloquent moments, while auditioning for the Gemini program, Armstrong suggests a deeper reason to explore the cosmos beyond just beating the Soviets to the punch: “When you get a different vantage point, it changes your perspective” about Earth. So it did, for virtually every astronaut gazing out his capsule window at the little blue dot, each returning with a heightened awareness to protect a planet we assume, erroneously, will always be around. Even in such a sedate and restrained biopic, that’s the sort of rah-rah patriotism that should unify us all. We have returned to the moon. There have been six separate (successful) manned moon missions for a total of twelve people who’ve walked on its surface. The last one was 46 years ago, not 49.